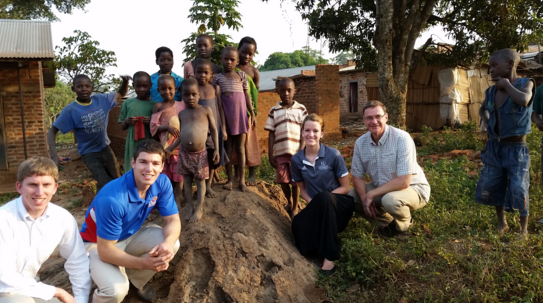 LAWRENCE In an effort to develop a clean, safe and consistent water source for a college in central Africa, the University of Kansas Engineers Without Borders (EWB) chapter traveled this month to the National Teachers College in Kaliro, Uganda. The team from the School of Engineering worked to implement a rain-harvesting system to aid students in daily activities such as cooking, cleaning and bathing. The KU EWB chapter’s trip Jan. 1-13 was the group’s second visit to Kaliro. During an initial fact-finding trip in early 2015, members found the college faced several challenges in meeting its daily water demands. One option was to gather water from hand-pumped wells located more than 200 yards from campus, which posed significant challenges when trying transport full jugs of water on the return trip. Lines at these pumps are often so long they require residents to plan an entire day around waiting for water. KU EWB spent the past year brainstorming and designing a potential solution to help the college with a significant portion of its water problem. The group drafted a plan to build a rainwater-harvesting structure for the school. Since EWB also focuses on sustainability, they planned to teach the community the proper way to maintain the structure once it is in place. "The system developed will not provide enough water for all needs of the students, but it will alleviate demand at the bore holes and will accommodate a more efficient method of obtaining water for cleaning and cooking activities," Fisher said. Once EWB returned home, the group planned to remain in contact with the college to evaluate the effectiveness of the project. It will also plan its next steps to help the community. The students on the trip had more than just work planned, including a cultural excursion and an eight-hour day rafting the Nile River. Engineers Without Borders is open to all students from any major and any grade level. All students in the program assist in fundraising for the trips. Students who travel tend to be evenly distributed by class, Fisher said. Alex Bycroft, junior in chemical engineering. Bob Lyon, professor of practice in civil, environmental and architectural engineering, who led the January 2015 trip to Uganda; Brian Lines, assistant professor of civil, environmental & architectural engineering, and Jacquelyn Ferguson of the Environmental Protection Agency have played major roles in planning this year’s trip. There are more than 50 members in the KU EWB chapter with 20 active members who help prepare for and plan the trips. Photo: KU Engineers Without Borders members Brett Wagner (left), Jeff Kraus, Tiffany Fisher and Bob Lyon, professor of practice in civil, environmental and architectural engineering, traveled to the National National Teachers College in Kaliro, Uganda, in January 2015 to learn more about ways to improve the safety and reliability of the college’s water system. KU’s Engineers Without Borders chapter returned in January 2016 to implement a rain harvesting system to help the college.